Stephen Colbert’s “Russia Week” on The Late Show might have another day left in it on Friday, but Thursday’s segment detailing the host’s recent adventures in Moscow was, as Colbert explained, “the whole damn reason” he went in the first place. What with the Trump-Russia investigation into possible collusion, major money laundering, and all manner of other undemocratic scheming by Donald Trump and pals revealing more and more depths (like one of those nesting dolls native to a certain country), one might think that Colbert was talking about a major interview or smoking gun regarding the nation-shaking, frighteningly credible allegations of actual treason by the President of the United States. Nah, it was the pee-pee tape. 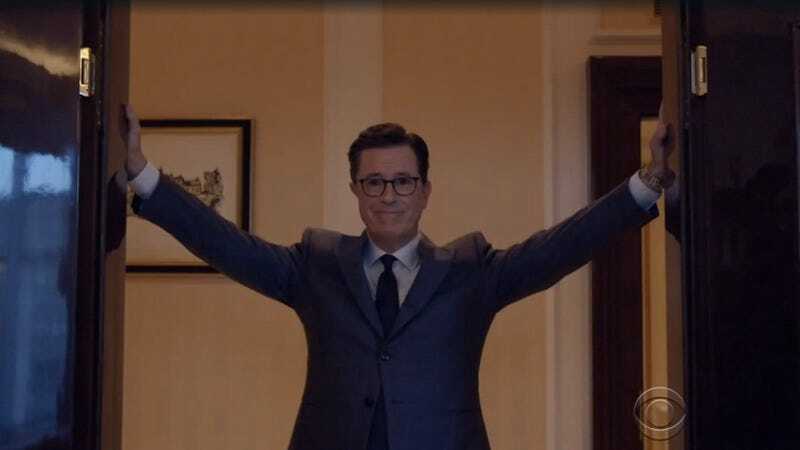 In the end, despite realizing that the suite’s window is in ridiculously easy binocular distance of the Kremlin itself, busting open one of the hotel’s fancy bowls looking for bugs, and letting fly a stream of pee-happy puns, all Colbert’s digging failed to strike water. (That the front desk called moments after Colbert broke that bowl did give credence to the rumor that the Moscow Ritz-Carlton is bugged up the wazoo, however.) Still, it made a certain comedic sense that Colbert’s elaborately silly investigation of the site of another of Donald Trump’s (alleged) nation-embarrassing exploits would just… dribble out.